Early May planting in Wisconsin has been documented to increase soybean seed yield due to increased light interception (Gaspar and Conley, 2015). In theory, earlier planting can potentially intercept greater amounts of solar radiation due to a longer growing season and therefore longer maturity group (MG) soybean varieties may be better suited to maximize yield if they can mature before a hard fall frost. Unlike 2013 and 2014, 2015 may provide growers with an opportunity to plant their soybean crop earlier than ever before. Yet, in some instances (weather or logistical problems) planting will be delayed or replanting may be needed. Therefore, investigating the effect of different MG’s at multiple planting dates across the state would provide WI growers with BMP’s for soybean establishment regardless of planting timing. To answer this question field trials were initiated at Arlington, Hancock, and Spooner, WI in spring of 2014. The five planting dates at each location were planting roughly on: (1) May 7th, (2) May 20th, (3) June 1st, (4) June 10th, and (5) June 20th. Planting after June 20th is not recommended in WI. Two varieties within each MG from a 2.5 all the way down to a 00.5 were tested depending upon the location and planting date and are displayed in Table 1. Table 1. Maturity Group’s tested within each location and planting date. Let’s start with the easy and redundant part, get your soybeans in the ground ASAP to maximize yield. This is evident again in this trial, where Figure 1 shows the effect of planting date across all MG’s (varieties) tested in 2014. If the soil is fit, soil temps are near 50 ˚F, and the forecast is favorable….. get the planter rolling! Figure 1. 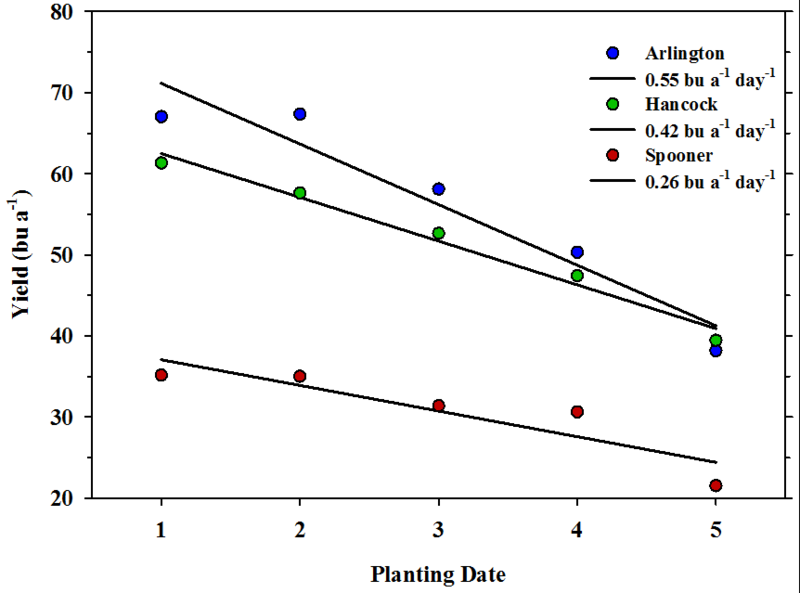 Dots represent the mean yield within each planting date for each location. The average yield loss per day for delaying planting past May 7th is presented in the legend. However, the question still remains for many producers, should I use a longer maturity variety in early planting situations (very possible in 2015) and should I switch to an earlier maturing variety when planting is delayed? Table 2. 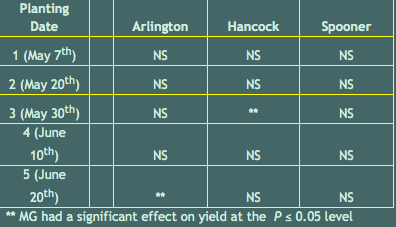 Effect of Maturity Group on Yield tested within each location and planting date. Based upon the 2014 data, only 2 out of 15 location x planting date combinations displayed a significant effect of MG on yield (Table 2). So the moral of the story is that within a realistic MG range for your region and planting date, variety selection should be based heavily upon the varieties past local and regional performance, disease package, and etc. Variety selection heavily based upon the MG is not a silver bullet to frequently increasing yields. However, there are always caveats…… Growers may consider trying a slightly longer maturing soybean on a portion of their acres because there is a “potential”, but not guarantee, for higher yields with no additional dollars spent. Within planting date 1, there was no significant MG effect, but MG 2.5 did yield the highest numerically in Arlington and Hancock with no fall frost damage, while the same is true for MG 1.5 in Spooner. The longest MG tested within each planting date in our study numerically yielded the highest through June 10th (planting date 4). On the back end of the planting season, the inverse was seen. Within planting date 5 at Arlington and Hancock, MG 1.5 did not mature before the first fall frost and was the lowest yielding. Therefore, growers may consider switching to an earlier maturing variety as planting is delayed into June. If switching to an earlier maturing variety, don’t use a variety less than 0.5 MG earlier than a full season variety (2.5 in southern WI) in early June. However, if planting is delayed into mid to late June then a variety that is greater than or equal to a full MG earlier should be considered. Acknowledgements: The authors would like to thank the Wisconsin Soybean Marketing Board and DuPont Pioneer for supporting this research. References: Gaspar, A.P. and S.P. Conley. 2015. Responses of canopy reflectance, light interception, and soybean seed yield to replanting suboptimal stands. Crop Sci. 55:377-385.